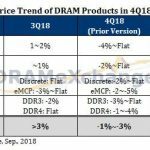 Contract DRAM prices increased by five percent in the third quarter of 2017, compared to the previous quarter, driving record quarterly revenues for DRAM makers, according to DRAMeXchange, a division of TrendForce. Due to continued tight supply and limited bit supply growth, DRAM revenue increased 16.2 percent sequentially. The market outlook for the fourth quarter indicates an average price hike of about 10 percent, according to DRAMeXchange’s research director Avril Wu. But prices could rise by as much as 20 percent for some products. 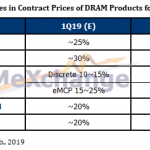 In the mobile DRAM market, Samsung has raised the price quotes for its products, and smartphone makers have no choice but to accept the price increases, said Wu. South Korean suppliers still hold the lion’s share of global revenues, pegged at 74.5 percent in the third quarter of 2017. 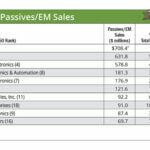 The top three suppliers – Samsung, SK Hynix and Micron – all maintained their top positions. Revenue market shares in Q3 for the top three suppliers were 45.8 percent, 28.7 percent and 21 percent, respectively. 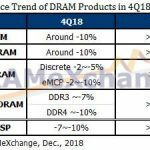 However, Wu expects higher DRAM tags will narrow the market share gap with Micron gaining some share in the fourth quarter. In Q3, Samsung’s revenues grew by 15.2 percent from the second quarter, reaching a “historic high” of $8.8 billion. SK Hynix’s revenue rose by 22.5 percent, reaching $.5.5 billion, and Micron’s revenue increased by 13 percent, recording $4 billion in sales. Taiwan’s domestic DRAM suppliers didn’t do as well in the third quarter. Nanya posted 5.3 percent growth in Q3, while Winbond posted 8.7 percent growth. 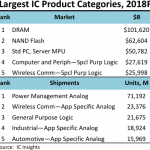 However, Powerchip’s revenue dropped by 3.6 percent due to more foundry work for other memory companies such as ESMT and AP Memory, which resulted in a capacity shift from DRAMs to other products. 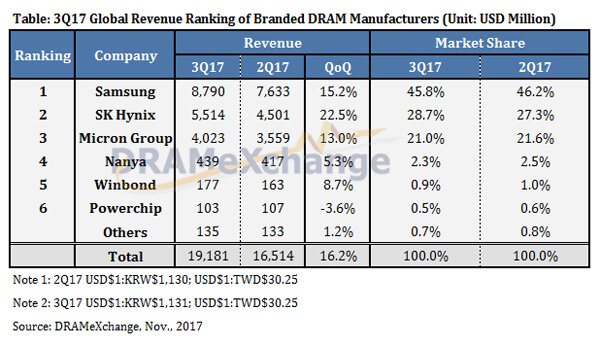 Wu expects the top DRAM suppliers to continue raising their operating margins due to increased prices. 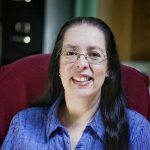 She believes SK Hynix and Micron will focus on improving yields and technology migrations while Samsung considers capacity expansion as a way to maintain its market leadership. Meanwhile SK Hynix’s 18-nm process will roll out small volumes of product at the end of the year and is building its second 12-inch wafer fab in Wuxi, China, which should be operational in 2019 at the earliest, according to Wu. Micron Memory Taiwan (formerly Rexchip) is expected to have a yield rate of at least 80 percent at its 17-nm process by the end of the year and Micron Technology Taiwan (formerly Inotera) plans to migrate half of its production capacity to 17-nm process in 2018. As suppliers continue to build their capacity and migrate to the latest technologies, demand for memory devices also will continue to grow. 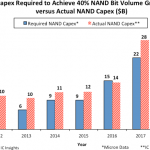 DRAM memory capacity per smartphone will rise by more than threefold, reaching about 6 GB by 2022, and DRAM capacity for servers will rise by more than 0.5 TB by 2022, according to Santosh Kumar, senior technology & market research analyst at Yole Développement (Yole). “Growth in these markets is fueled by applications such as deep learning, data centers, networking, AR/VR, and autonomous driving,” said Kumar, in a statement.